Metro Atlanta is broadly defined by the terms ITP (Inside The 285 Perimeter beltway) and OTP (Outside The 285 Perimeter beltway). ITP can be segmented by our freeway system into 6 areas: NE (north of I-20 and east of the 75/85 Connector); NW (north of I-20 and west of the 75/85 Connector); SE (south of I-20 and east of the Connector); SW (south of I-20 and west of the Connector), the Buckhead Neighborhoods (north of the 75/85 Connector split, between the two freeways and south of the 285 beltway); and, finally Downtown around which it all circles. However, with the recent completion of Eastside Trail section of the Atlanta Beltline and proposed completion of the entire circuit, Atlanta's intown neighborhoods are coming together more than ever. 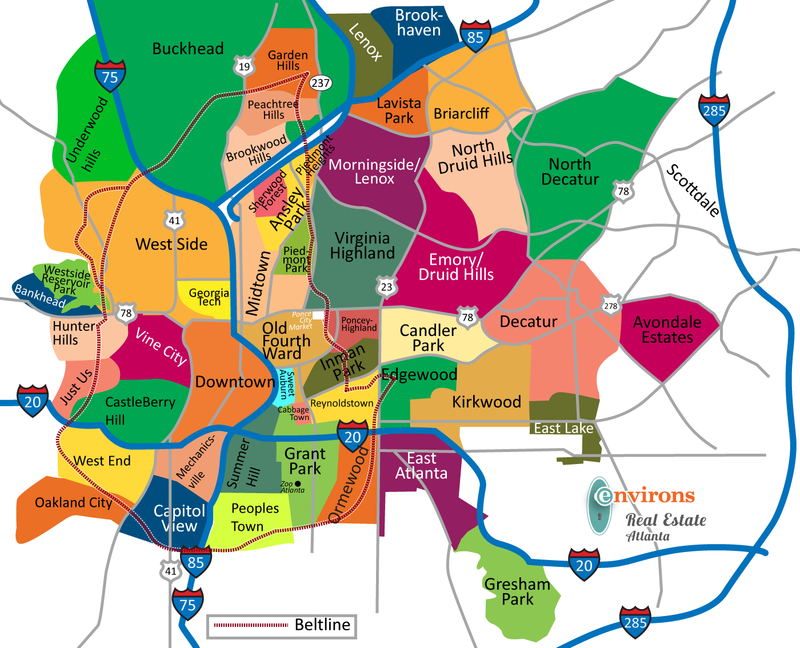 Our Atlanta neighborhoods map, displays all the neighborhoods within the beltline as well as some of the most sought after intown (ITP) neighborhoods.